Today’s pulp-fiction devotees, born during the Baby Boom years (1946 to 1964), are too young to have bought rough-paper magazines on the newsstands and therefore gravitate primarily to those characters whose life spans were extended by Sixties paperback reprints and frequent appearances in other media: Conan, Tarzan, Doc Savage, The Shadow, and so on. Lester Dent, Walter B. Gibson, and Robert E. Howard are lionized in the fan press, and justifiably so. But they were not pioneers; they trod paths already well worn by the generation of pulpateers that preceded them. And of those, one loomed larger than most of his contemporaries. Born in 1887, Henry James O’Brien Bedford-Jones spent his early months in Ontario, Canada, the family moving to Michigan when he was barely a year old. The future fictioneer showed an aptitude for writing as a public-school student, and he matriculated at Toronto’s Trinity College but dropped out after one year to pursue a career in journalism. As H. Bedford-Jones, he contributed to newspapers in Detroit and Chicago before turning his hand to fiction. His earliest short stories appeared in Frank A. Munsey’s pioneering pulp magazine, The Argosy, during 1909. He was not quite 22 years old when editor Matthew White purchased them. Published under the pseudonym “H. E. Twinells,” these initial efforts revealed him to be a born storyteller, if not a literary wunderkind. Over the next few years Bedford-Jones threw himself headlong into full-time fiction writing, placing additional yarns with The Argosy and its sister pulp, The All-Story (later All-Story Weekly), as well as Street & Smith’s People’s Magazine, Top-Notch Magazine, and New Story Magazine. In a 1914 Argosy two-parter, “The Gate of Farewell,” he created what would become his most popular series character: John Solomon, the outwardly amiable, innocuous-looking Cockney who was actually a capable covert operative of the British government. Late in 1914 Bedford-Jones submitted a book-length novel to The Blue Book Magazine, an up-and-coming sheet published by Louis Eckstein’s Story-Press Corporation. Edited by Ray Long with the assistance of young Donald Kennicott, Blue Book was finally hitting its stride after several years of relative mediocrity. Long purchased the yarn from Bedford-Jones, beginning the author’s decades-long relationship with the magazine. A historical adventure set in early 19th-century America, The Wilderness Trail saw print in the February 1915 issue alongside tales by such popular fictioneers as H. Rider Haggard, E. Phillips Oppenheim, Ellis Parker Butler, and Albert Payson Terhune. Over the next 34 years H. Bedford-Jones sold Blue Book an astounding 360 stories, including another five complete-in-one-issue novels and seven serialized novels. He was prolific in every genre but seemed to have a special affinity for historical adventures. Although he had no trouble selling to Long’s successor, Karl Harriman, it was Blue Book’s next editor, Donald Kennicott, who bought the most Bedford-Jones stories—some 280, of all lengths, between 1935 and 1949. Having gone through a rough patch in the early years of the Depression (the inevitable consequence of failing magazines and reduced word rates), H. Bedford-Jones evolved the strategy of pitching editors not just individual yarns but entire series of stories with a central theme. In 1934 he simultaneously persuaded Kennicott and Short Stories editor Harry Maule to let him adopt this approach. Blue Book’s February 1935 number offered the first installment of “Arms and Men,” a historical series that extended to 28 entries. Bedford-Jones followed this in 1937 with two more skeins, the self-explanatory “Ships and Men” and 17 Foreign Legion adventures collectively titled “Warriors in Exile.” In 1938 he launched what is arguably his best-remembered series for Blue Book. “Trumpets to Oblivion” combined fantasy, science fiction, and historical adventure. The premise involved a wealthy inventor’s perfection of a combination time machine and TV set—a device that reached back into the ether and retrieved images from past history. Each series installment opened with the inventor welcoming an audience to monitor the repeat “broadcast” of some famous event. 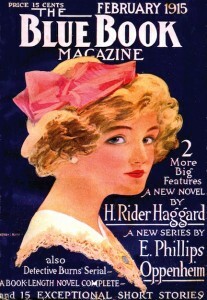 Bedford-Jones wrote 19 series for Blue Book, some of them overlapping, and until he died in 1949 each issue contained at least one and often two installments. They were published under his own name and also as by “Gordon Keyne” and “Captain Michael Gallister.” He occasionally turned out novel-lengthers for Kennicott as well, the most memorable of these being They Lived by the Sword, a fictional account of Hannibal’s army crossing the Alps. Remarkably, in addition to pounding out his Blue Book work, Bedford-Jones still found time to contribute regularly to other pulps, placing thematically linked series in Weird Tales and Short Stories as well. An obituary published in the New York Herald-Tribune stated that H. Bedford-Jones earned more than a million dollars during his 40 years as a fiction writer. In King of the Pulps: The Life and Writings of H. Bedford-Jones (Ontario: The Battered Silicon Dispatch Box, 2003), Peter Ruber estimated that the veteran pulpateer wrote a minimum of 25 million words. The true total may never be known, as Ruber allows that some yarns could have appeared under pseudonyms not yet attributed to the legendarily prolific author. The Wilderness Trail is a seminal work in Bedford-Jones’ oeuvre. It not only kicked off his 34-year association with Blue Book but also was his first historical novel with an American setting. The author had a deep and abiding interest in the country’s post-Revolutionary War expansion and returned many times to the milieu he describes so well in this yarn. His employment of such real-life characters as Daniel Boone, Zachary Taylor, John J. Audubon, and the Indian chief Tecumseh is particularly skillful; we have no way of knowing if these historical figures ever interacted, but Bedford-Jones weaves the tale so cleverly that it’s easy to believe they did. The novel is ambitious but never unwieldy. Its plot is straightforward and seemingly random or divergent events are shown in the concluding chapters to have a critical bearing on the adventure’s climax. The story’s only failing—a minor one—is the awkwardness of romantic interludes featuring hero and heroine. The dialogue in these passages is stilted, which is surprising inasmuch as the exchanges between male characters have a natural ring. Despite having been written relatively early in the author’s career, Wilderness Trail is a smooth, polished work with the unimpeded narrative drive that was a hallmark not only of H. Bedford-Jones, but of all popular and successful pulp fictioneers. Strangely, no American firm published it in book form, although the London-based firm of Hurst & Blackett Limited issued a British hardcover edition in 1925. Murania Press is both happy and honored to present to American readers this fine example of early pulp fiction, available in this country for the first time in nearly a hundred years. Thanks for a very nice piece on H. Bedford-Jones. Great piece on Bedford-Jones.I am a big HBJ fan and really am looking forward to the appearance of “The Wilderness Trail”.Bedford-Jones’s historical fiction is his best work in my opinion.Thanks Ed. Thank you for this helpful and concise review of my cousin’s writing and for keeping his work in front of the public. Can you give me any up to date information on Peter Ruber? You hit the spot with the opening sentences of the above article. Yeh, I’m a baby boomer who grow up facinated with the now famous 1960’s covers of Doc Savage reprints. I discovered Robert E. Howard via Marvel Comics. And now I’ve discovered a new name thanks to a bargin cart outside probably the last specialty book store in NYC; Mysterious Book shop in the Wall St. City Hall area. Oh, yeah & I thank Black Dog Books for publishing 2 of his lesser short stories: ‘The Ociean Bastille’ & ‘The Isle of Trouble’. I’ll be on the lookout for any republications of his works in the future.